On 15 January Belarusian president Aliaksandr Lukashenka set off for official visits to Egypt and Sudan, where he conducted negotiations with the leaders of the two countries. Belarus is trying to broaden its economic relations with developing countries. However, its seems that the main reason behind Egypt and Sudan's growing interest in Belarus lies not in the high quality of Belarusian goods but because other nations do not want to cooperate with them. The way Belarusian officials cover the president’s visits to African or Asian states follows a predictable pattern. They emphasise the necessity of increasing mutual turnover, particularly in Belarusian export, as well as the importance of new agricultural and industrial projects. These figures clearly demonstrate that Belarus has managed to find a niche on the Egyptian and Sudanese markets. The Belarusian authorities must now try not to lose it, and expand Belarus's presence in these countries. In spite of ambitious declarations by Belarusian state officials, the results of the visits may not end up being very significant. In discussing the economic cooperation between the countries, the Egyptian mass-media was cautious in their estimations. The newspaper Masr Alarabia emphasised the weakness of the Belarusian economy, non-developed private business, and the low level of foreign investments coming mainly from Russia. According to the newspaper, agriculture is one of the main sectors of the Belarusian economy. Thus, the countries should concentrate their efforts on developing cooperation in this sphere. The newspaper Al Youm el Sabea focused on diplomatic declarations, as well as on Mikalai Lukashenka’s visit to the Pyramids. Belarusian investments in Egypt remains very low, hovering around $1.3m. The Egyptian authorities do not expect any significant investments from Belarus. It seems that Egyptian economists consider Belarus to be a relatively successful agricultural country and would like to use Belarusian experience and capacities to develop Egypt's agricultural sector, particularly, in reclamation of new agricultural lands. Thus, the main point of interest lies in possible supplies of Belarusian agricultural machinery and equipment. Due to its ambitious plans to add about 3.4m acres of reclaimed land by 2017, the Egyptian government has tried to increase imports of agricultural machinery. However, Belarus has never been among the top 10 suppliers of agricultural machinery to Egypt, failing to compete with such countries as the USA, China, Germany, etc. The table above points to a lack of any clear trend for Belarusian tractor export to Egypt; over the years, demand has varied significantly. Moreover, the figures show that tractors' share in the overall Belarusian export to Egypt is decreasing. In other words, exports are successfully diversifying. 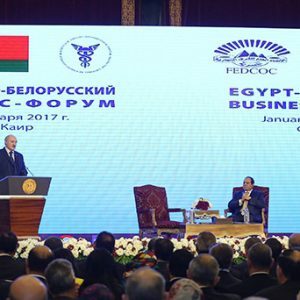 Why is Belarus becoming more interesting to Egypt? Thus, the intentions of the Belarusian authorities to strengthen their position on the Egyptian market seem realistic. Egypt already has plants for assembling Belarusian tracks and tractors. In March 2016, the Minsk Automobile Plant opened its representational office in Minsk. However, the economic situation in Egypt risks becoming a serious obstacle to cooperation. Since 2011, the country has faced a deep economic crisis. With the national currency decreasing by almost 300 per cent, Egypt is suffering from a lack of foreign currency and can hardly pay for already signed contracts. In this context, the Egyptian authorities are trying to find more loyal and patient partners. Belarus risks facing problems either with payments or with profitability of its supplies. For example, the average price for a Belarusian tractors shipped to Egypt in 2016 was 20 per cent ($12,103) less than the average price for other consumers ($15,080). The second point of interest concerns Belarus’s participation in Eurasian integration and access to the attractive markets of Russia and Kazakhstan. However, the Egyptian government enjoys sustainable relations with Russia and it seems unclear to what extent Belarus can develop its cooperation with Egypt in this sphere. Relations with Sudan: a second revival? Belarus started to have very intensive relations with Sudan in the early 2000s, and in 2004, Sudanese leader Omar al-Bashir visited Belarus. Due to the internal conflict in Sudan, the parties paid special attention to military and technical cooperation, including supplies of military goods. However, the scale of cooperation has never been stable. The easing of international sanctions on trade with Sudan in January 2017 forced the Belarusian authorities to intensify their efforts to expand Belarusian export to the country. Belarus has already proposed its services in the spheres of oil-field exploration and exploitation. Not surprisingly, the Joint Sudan-Belarus Ministerial Committee is headed by the Sudanese minister of petroleum and gas, Muhammad Awwadh. Joint manufacturing of vehicles and machinery production also seem to be in the offing. Previously established contacts, as well as a Sudan-Belarus business forum organised during the visit, will help to promote cooperation. Belarus faces a serious economic crisis. The amount and value of its exports is falling and the country is looking for new markets, or at least intends to expand existing ones. In this context, countries such as Egypt or Sudan, where Belarus enjoys a relatively sustainable position, look to be promising partners. Belarus is proposing a traditional set of goods (focusing on agricultural machinery and to a lesser extent on agricultural products) and services, including oil prospecting. The main problem, however, lies in the following question: why have these countries become more interested in Belarus now? Both Egypt and Sudan suffer from economic crises. Few countries consider them reliable partners. The Belarusian authorities should make efforts to guarantee the implementation of signed agreements and expand the scale of cooperation. Dealing with economically weak countries involves many risks. Belarus has already suffered from this in the past, when Mozambique and Zimbabwe defaulted on payments. The country should be careful with supplies without 100 per cent payment in advance. Aliaksandr Filipau is the Dean of the Faculty of Extended Education at the Belarusian State University of Culture and Arts, and expert of the NGO 'The Liberal Club'. 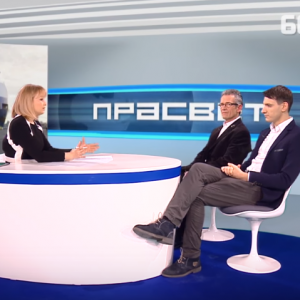 In January, analysts at the Ostrogorski Centre discussed Belarus’s new oil war with Russia, the dynamics of Lithuanian investments in Belarus, and the initial impact of visa-free regulations on Hrodna Region. The Ostrogorski Centre released the analytical paper ‘Belarusian business education: from a command economy to the market’, which resulted from the Fourth Annual Dutch-Belarusian-Polish conference on education. The Centre also published the 2016 issue of the Journal of Belarusian Studies. Vadzim Smok discusses whether Belarus stands a chance in a new oil war with Russia. Oil products remain Belarus’s No.1 export commodity, making up a third of Belarus’s export revenues. Meanwhile, Russia has less and less need of political allies as it increasingly relies only on itself. The country is also adjusting its military policy to ensure its independence from the Belarusian army on the western front. With no alternative options for hydrocarbon supplies, and Minsk’s decreasing political and security leverage, the country will have to play by Moscow’s rules. Ryhor Asapenia analyses recent developments in Lithuanian investment in Belarus. Lithuanian businessmen have become the largest Western investors in Belarus, adding more than €80 mln to the Belarusian economy in 2015. Investments remain at a high level, although several Lithuanian companies have abandoned their projects because of the Belarusian economic crisis. Moreover, the poor political reputation of the Belarusian authorities still discourages Western businessmen from investing. Alesia Rudnik writes about the initial impact of the new visa-free regulations on Hrodna Region. In response to the increasing number of foreign tourists, Hrodna Region has started work on two important initiatives: visa-free railway voyages and launching low-cost flights to Hrodna airport. However, making railway services and the Hrodna airport accessible visa-free will not attract many more tourists if more tourist services are not first developed. Extension of the visa-free territory to the whole of Belarus and investment in the development of services would significantly improve the popularity of Belarus for tourists. The Ostrogorski Centre releases an analytical paper which resulted from the 4th Annual Dutch-Belarusian-Polish Conference ‘Education as a Human Right: Modernising Higher Education to Meet the Challenges of the 21st Century’. The sphere of Belarusian business education is experiencing very challenging times in connection with the economic crisis in the country. Over the last three years, the amount of turnover in the market in dollar terms has decreased by nearly half, according to various assessments. Three key problems exist today which representatives of the government, the international community, and business educators would do well to focus on: state regulations, poor integration into the international educational space and lack of affordable business education in the regions of Belarus. The 2016 issue of the Journal largely resulted from a conference organised by the Ostrogorski Centre and the UCL School of Slavonic and Eastern European Studies in London in March 2016. The conference gathered around 20 scholars of Belarus from the United Kingdom, United States, Germany, Canada, Poland, and France. Three papers were selected for publication alongside the annual lecture on Belarusian Studies delivered by Professor Andrew Wilson. The electronic version of the Journal is available here. The paper version of the Journal is available for purchase here. Ryhor Astapenia analyses Lithuanian investments in Belarus on Polish radio. Lithuania remains the largest Western investor in Belarus. Lithuanians understand the Belarusian mentality and see many opportunities in the Belarusian economy. Due to the recession, Belarus has become less interesting for investors, while political tension between the countries over the Astraviec NPP does not affect business interests, the expert believes. On the PraSviet programme on Belasat TV, Ryhor Astapenia comments on the role of Belarus in the Russian defence system. Moscow no longer considers Lukashenka a close ally, but is instead militarising its western regions. According to Ryhor, Russia will not consider placing a military base in Belarus in the nearest future. However, the issue may appear on the bilateral agenda again when Belarus has a weaker bargaining position. Al Jazeera quotes Igar Gubarevich in an article about the Astraviec nuclear power plant. Igar argues that Lithuania’s resistance to the plant is partially fuelled by the fact that BelNPP is being built by Russia, whose technology and influence is widely mistrusted in the Baltic country. The series of incidents at the construction site has made Lithuania’s position stronger. Now, Belarus will have to make an extra effort to address safety concerns. On Polish radio, Ryhor Astapenia analyses the interconnection of the Belarus-Lithuania dispute over the Astraviec NPP and a potential re-orientation of Belarusian cargo transportation routes. So far, Belarus primarily uses Lithuanian ports, but Russia and Latvia may take advantage of the cooling relations between Minsk and Vilnius to promote their interests. Igar Gubarevich analyses Belarus’s vote at the UN General Assembly on Polish radio. The vote shows that Minsk is pursuing a much more independent foreign policy than most observers believe. The positions of Minsk and Moscow appear out of sync on almost a quarter of issues. At the same time, the Belarusian government will not cross certain red lines defined by the Kremlin. The Belarusian delegation would never vote for a resolution condemning the Russian government. Dzmitry Kruk. Causes and characteristics of the economic downturn in Belarus: the role of structural factors. BEROC, 2016. Maryja Akulava. Current gender trends in Belarusian labor market: wage gap, child penalty and marriage premium. BEROC, 2016. Ihar Pielipaś, Iryna Tačyckaja. Corruption study based on the survey of Belarusian small and medium-sized enterprises. IPM Research Centre, 2016. Hlieb Šymanovič, Mattias Morgner. Implementation of state programmes in Belarus: recommendations to improve the effectiveness. IPM Research Centre, 2016. Ryhor Astapenia. Belarusian business education: from a command economy to the market. Ostrogorski Centre, 2017. Think tanks in Belarus are encouraged to submit their research for inclusion into the database by completing this form. The Ostrogorski Centre is a private, non-profit organisation dedicated to analysis and policy advocacy on problems which Belarus faces in its transition to market economy and the rule of law. Its projects include Belarus Digest, the Journal of Belarusian Studies, BelarusPolicy.com, BelarusProfile.com and Ostro.by.